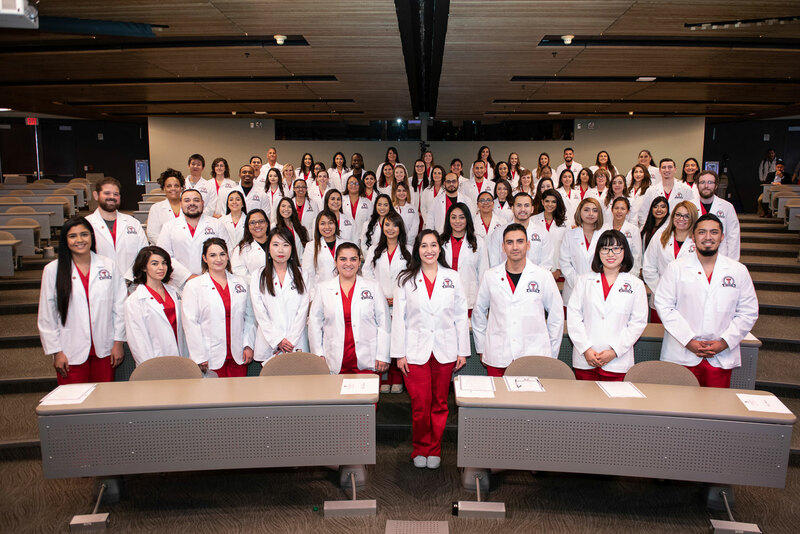 In a first for El Paso, the Gayle Greve Hunt School of Nursing (GGHSON) Class of 2020 received their first white coats during a ceremony Friday, Jan. 18, at the Misenhimer Auditorium. The White Coat Ceremony is a traditional rite of passage for entering health care students. Started in 1993 by Arnold P. Gold and his foundation, the ceremony is designed to remind students of the humanism inherent in their chosen field. Though students in the Paul L. Foster School of Medicine have had white coat ceremonies in the past, the ceremony was a first for nursing students in the city. The GGHSON Class of 2020 received their first white coats during a ceremony Friday, Jan. 18, at the Misenhimer Auditorium. Taoheed Kassim Jr., who comes from a family of health care providers, previously worked as an emergency medical technician in his hometown of Houston before deciding to pursue a nursing degree at GGHSON. He sees it as a career that will have a positive and lasting impact on society. “This being the first white coat ceremony (for GGHSON), I feel the responsibility it is going to have on me and society, and I’m ready to take on the challenge,” Kassim said. The ceremony featured the recitation of a student oath, the presentation of white coats and a keynote address from Linda Lawson, D.N.P., R.N., chief nursing officer at The Hospitals of Providence Transmountain Campus. GGHSON Dean Stephanie Woods, Ph.D., R.N., introduced the Class of 2020, and Assistant Dean and Chair Manny Santa Cruz, D.N.P., R.N., gave opening and closing remarks. The ceremony provides a powerful emphasis on compassion in combination with scientific excellence. The most important element of the event is the oath that students take to acknowledge their central obligation of caring for the patient. Check out a photo gallery of the event on the TTUHSC El Paso Facebook page.